I’m nearly a month into my transition to the Dvorak keyboard layout. I am typing at a very sustainable speed so this has not slowed down my work. For me, it is significantly more comfortable than typing QWERTY for 8-12 hours per day. One of the interesting aspects of this keyboard layout is that the Z, C, and V have moved from the left to the right-hand side of the keyboard. The X is in the center and can be pressed with either hand. While Mac OS X has a mode that preserves the locations of these hot keys when the Command button is pressed, I have intentionally chosen to use the proper Dvorak key locations for shortcuts as well. I found that I already had the manual dexterity in my left hand to accurately manipulate the pointer. Within a couple of days, this became a very comfortable setup. An added bonus is that I do not have to jump the number pad with my right hand to access the mouse. 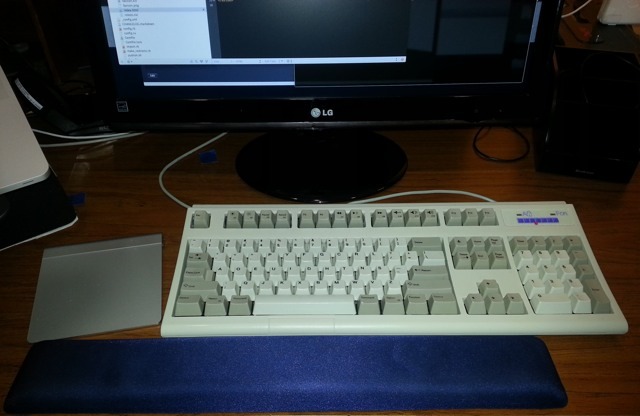 You may notice also that the main portion of the keyboard is placed directly in front of my main monitor. I find that this makes it easier to touch type while focusing on the screen and sitting in a natural position with my feet firmly on the floor. I am really liking this new setup.